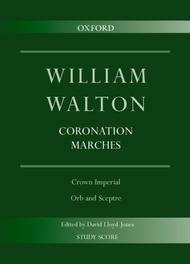 Coronation Marches: Crown Imperial & Orb and Sceptre composed by William Walton (1902-1983). Arranged by David Lloyd-Jones. For Full orchestra (Crown Imperial: 3 flutes (III+piccolo), 2 oboes, english horn, 2 clarinets, bass clarinet, 2 bassoons, contrabassoon, 4 horns, 3 trumpets, 3 trombones, tuba, timpani, 2 percussion (cymbal, bass drum, snare drum, glockenspiel, tenor drum, tubular bells, go). Scores. William Walton Edition. Miscellaneous. Study score. 104 pages. Duration 7', 7'. Published by Oxford University Press (OU.9780193366138).ISBN 9780193366138. Miscellaneous. 10 x 7 inches.Walton's two coronation marches - Crown Imperial, written for the coronation of George VI in 1937, and Orb and Sceptre, written for the coronation of Elizabeth II in 1953 - are both stirring marches with sweeping tunes, and famous examples of the genre.